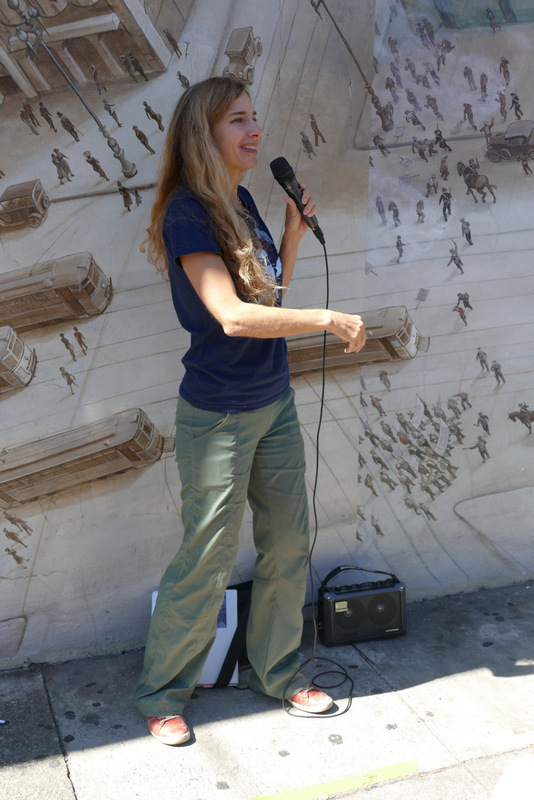 Today i went down to Mona Caron’s Market Street Railway Mural at 15th and Church because i’d got word that a talk was being given about its restoration and that Mona Herself might be there. Yep, she was, and she gave us a great explanation of the work that was being done to restore the mural, it having survived thirteen years of San Francisco weather, baked by the sun in the mornings and then cooling off by forty degrees at night, being rained on, etc. to the point that some of the paint was fading badly and, worse yet, the wall itself was cracking and blistering. The restorers are doing a fabulous job and she is touching up areas where the acrylic paint was damaged beyond repair. Better yet, she gave us a great explanation of the mural itself, and i am horribly embarrassed that even though i’d admired this mural for a dozen years, i had never examined it closely enough, so my understanding of it was woefully inadequate. However, the man who videotaped her talk told me that he’ll send me a link when it’s available. If that happens, my plan is to write an explication of the mural that i can supplement with closeup photographs. Stay tuned. The high point, though, came after her talk when i got to tell her that i’d been a fan since about 2005, had photographed all her San Francisco murals, and was an avid follower of her website. Then i hung around until everyone else in the crowd had got a chance to talk to her and told her about the time i went to take photographs of her Tenderloin mural. As i approached Jones Street on Golden Gate, i found myself rolling past a crowd of Black men hanging out at the corner. They called out at the Segway, so i stopped and told them what i was about to do, at which point they swarmed me, escorted me across to the mural, and acted as a pack of docents eagerly explaining various aspects of the mural and identifying some of the people depicted in it. This is their mural, and they adore it. She gave a great chortle, in which i basked. Here she is, speaking in front of the Railway mural. The panel along the right side depicts the 1934 San Francisco General Strike in which two strikers were killed and dozens injured by the police. That’s not discoloration at the top of the panel, it’s tear gas.